In addition to the each division’s updated Top 25, a trio of clubs at each level are featured who are just on the outside looking in. Their inclusion doesn’t necessarily mean they’d be the next three schools in the rankings, they’re just a handful of schools whose on-the-diamond results are getting more than simple passing attention (although the hypothetical No. 26 is included in each). In regards to the regular updates, there wasn’t much moving or shaking in the Top 25. In the D-II and NAIA, there were no expulsions from the rankings, and in D-III there was only a single swap. This is also the first update this season in which each of the three top teams remained the same from the previous week. Rankings are based on games through Sunday, March 10. The absence of Delta State is a glaring exclusion from the Perfect Game Top 25. The Statemen are currently 17-3 and were awarded the top spot in the NCBWA rankings last week. Nevertheless they still have to prove their way into Perfect Game’s national list of elite this spring. While their record is impressive, it has come at the hands of subpar competition as each of the four teams that DSU has won series against this season – East Central, Montevallo, Union and West Georgia – have losing records. The Fighting Okra do have two wins over Southern Arkansas, but each of those were single-game affairs which don’t have the same credibility as a good fashioned series win. It’s also a bit concerning that the team is only batting .277 despite facing such middle-of-the-road pitching. That’s a quality average for sure, but not one that you’d expect to see from one of the top team’s in the country. The pitching has put up stunning numbers, earning a 1.66 ERA so far and those numbers should only improve with an upcoming series against perennial also-rans Christian Brothers this weekend. However, it may not be until their series with West Florida that DSU finally earns Perfect Game recognition this spring. If they take care of business that weekend against the Argos they’ll enter the Top 25 with a splash. With a trio of preseason all-Americans who fueled an offense which finished in the top three nationally in batting average and runs scored, and returning pitchers who amassed nearly 300 innings on the mound, the Braves seemed a sure bet for a big season. Their initial outlook was so good that they earned the No. 3 ranking in the D-II preseason rankings and their leadoff hitter, Luke Jackson, was the player pictured to head the Perfect Game D-II College Preview. As anticipated, the Braves looked good to start the season, winning six of their first seven games; those victories included a sweep of an always-competitive Shepherd squad. However, their fortunes took a sudden abrupt turn for the worse. They lost series with Augusta, Lander and Young Harris, were crushed by 1-13 by Catawba and also blew a six-run lead to Queens, a program in just its second year of existence (and who is currently 5-13). Heading into last weekend the Braves were a less-than-stellar 8-10. Nevertheless last weekend the Braves played as predicted as they were able to twice rally back from deficits on Sunday to earn a series win over previously fourth-ranked Columbus State. 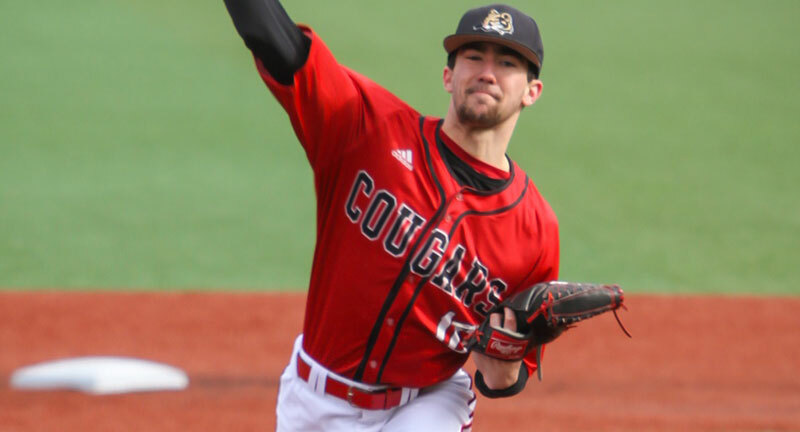 Their Friday night win included a dismantling of USA Baseball Golden Spikes Award watch list pitcher Kolton Ingham, knocking the ace around for nine hits and four earned runs in five innings. With the convincing wins UNC Pembroke received consideration to re-enter the Top 25, but those early losses are still too close in the rear-view mirror and not out of site yet. A midweek win over a solid Barton squad, followed by a series sweep of a sub-.500 Anderson team could put them back in the mix next week based on them finally playing to their potential. The Rams have been teetering on the edge of the Top 25 and almost made it this week following their decisive series win over Texas A&M Kingsville. It was their second series win of the year over a ranked team as they took two of three from Lubbock Christian in the middle of last month. The wins pushed their season record to 18-5 and they are among the Lone Star Conference leaders in several important offensive categories. However their 5.04 team ERA is only thing keeping them out of the Top 25 for now. The staff has been roughed up a bit and has gave up at least six runs eight times this spring. Nevertheless, if they keep hitting they way they have, their pitching doesn’t need to be precise. Another strong showing this weekend against UT Permian Basin could elevate them into the Top 25 in time for a massive showdown against West Texas A&M to close the month. The Wolverine-Hoosier Athletic Conference has traditionally been one of the hardest races to call with a top-heavy table that cannibalizes each other every week. Indiana Tech appears to be the frontrunner, but there is always enough talent in the WHAC for a pair of teams in the Top 25. Madonna got the nod early, but they are barely above .500, and Northwestern Ohio, who reached the NAIA World Series last season, is near the bottom of the standings. With that, the Cardinals appear to be the next viable contender. Concordia has been a solid team as of late, averaging well over 35 wins the past three years. Currently the team has an NAIA-leading 1.84 ERA and is fourth in opposing batting average, limiting their competition to a .190 mark. However, none of their wins this season are against a Top 25 team, and they also haven’t been against a club that would be in the top 40 if the rankings were expanded (although Rio Grande isn’t too shabby, they’d be close). With that being said, Concordia will have a chance to prove themselves with upcoming contests against Southeastern and Warner next weekend. If they continue to win the games they should, and are able to at least earn one win against one of The Sun Conference schools, the Cardinals should find their way in sooner rather than later. The Spartans, who won at least 43 games in each season from 2014-2017, suffered a bit of a setback last year as they came out on top in only 32 contests. It was still an impressive total, but not to the standard Coach Uschold has come to expect. With that, the Spartans were unceremoniously left out of the Top 25 to start the season, but nonetheless they’re one of a few non-ranked teams whose box scores are scrutinized for inclusion with each update. They had their chance to make a move late last month when they played last year’s national runner-up Freed-Hardeman, but were solidly swept by the Lions. Currently at 13-5, MBU is still a rankings outsider, but with an upcoming home series this week with Lyon, the Spartans could make next week’s list. They also have a doubleheader with Central Methodist that could cement their standing. With that being said, MBU will need to win two of three against the Scots to enter the rankings and then win at least one against the Eagles to remain – provided of course they don’t needlessly lose any other contests along the way. The Cougars were a rankings dark horse entering this season following their phenomenal 31-21-1 debut last year. Almost every single player is back from that virginal club which would cause one to speculate that their total will only increase this season. So far the Cougars are a respectable 12-6 with their only losses being to heavyweight Tennessee Wesleyan and three-time national champions Cumberland (of which both losses were by a single run). Playing in the River State Conference puts IU Kokomo at a bit of a disadvantage as there are no teams from the group currently ranked. Therefore, the Cougars are going to have to accumulate wins in quantity rather than quality. If they can continue to win games at an elevated clip, along with capturing series over IU Southeast, Rio Grande and previously ranked Point Park, the Cougars could find themselves in the Top 25 by the end of the season. Had the Hawks won their series over LaGrange this past weekend it would be Huntingdon rather than the Panthers closing out this week’s D-III Top 25. While they did lose the series, they did earn a win over LaGrange which makes it the third time this season they’ve gotten the W over a ranked team as they topped Wisconsin-Whitewater and Spaulding earlier this year (they’ve also beat Rhodes who stated the season in the top 20). Interestingly the Hawks have only hit a pair of home runs in their 16 games this season. However, when you’re hitting .322 as a club with solid defense and have a solid bullpen with the ilk of John Crawford and Tucker Duke, who have only allowed a single earned run in 13 combined appearances, you don’t need the long ball to win. The Hawks should continue to add to their growing win total this weekend as they play Brevard. After that they have a series with a strong Methodist University team as well as a pair of games with Birmingham Southern. If they’re able to win at least three of five against the Monarchs and Panthers they will be a Top 25 shoo-in. Speaking of Methodist, the Monarchs are another team on the cusp of the Top 25. The Monarchs started the season by taking two from Roanoke, a team that broke out to win 66 games over the past two seasons. Currently they are coming off 18-3 and 11-2 poundings of Berea to win 10 consecutive games. Those scores against the Mountaineers could have been even more out of balance as Methodist stranded 22 men on bases during the wins. Eventual All American Alex Kachler has powered the team this spring. After leading the Monarchs in batting average and total bases last season, as well as the USA South Atlantic Conference in RBI and doubles, he is currently batting .443 with 10 extra-base hits and only four strikeouts. The Monarchs were snubbed when NCAA postseason invites were handed out last year despite a 32-12 record. You can bet they are going to do everything possible to make sure they don’t get overlooked again. They host a respectable Maryville Scots team this week before some very important matchups against Tufts and the previously mentioned Huntingdon series. The Tornados were the last team out of this week’s Top 25 having started the season with a program-best 14-1 record and sweeping the reigning national champions UT Tyler last weekend. Their pitching has been particularly masterful with Matthew Williams, Calvin Bush and Diego Cruz-Garcia each posting 2.25 or lower ERAs and having only allowed a combined 42 hits in 60 1/3 innings pitched while striking out 69. The everyday lineup is also contributing mightily to the team’s winning ways. While they only have a single home run, they are topping the American Southwest Conference in batting at .322 and are also first with a stellar .969 fielding percentage. It will be impossible to overlook CTX once more if they extended their nine-game winning streak at the Russmatt Tournament this weekend. They’ll play a host of quality clubs that includes top-ranked Rowan. Dropped out: Baldwin Wallace (21).